Screaming with Laughter is back! 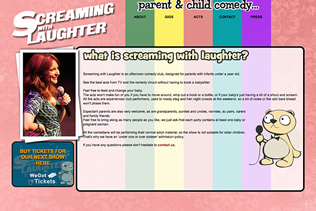 Hello, we are starting monthly parent/carer and baby comedy events in Balham and Chiswick. It’s like a normal comedy club, except in the afternoon so you don’t have to book a babysitter. Next Wednesday, 26th of Feb, we’ll be at the Bedford in Balham. Next Thursday, 27th of Feb, we’ll be at the George IV in Chiswick. Doors open at 1 and tickets cost just £5. The acts in Balham will be me (MC) plus Tom Allen and Stuart Goldsmith. In Chiswick, we have me (MC) plus Tom Allen and Rob Deering. We hope you can join us, please spread the word!